Visual acuity is described as the number 20 over another number. 20/20 is considered normal, though not perfect vision, as it allows for some imperfections. Each line of the eye chart has a number next to it that indicates the distance in feet at which a person with normal vision can read it. Larger letters have higher numbers, because they can be read from greater distances. For example, in the chart above, the "Big E" is on the 200 line, while the "H" and "N" are on the 100 line. A person with normal vision can read the "E" at 200 feet, while the "H" and "N" are only visible from 100 feet. 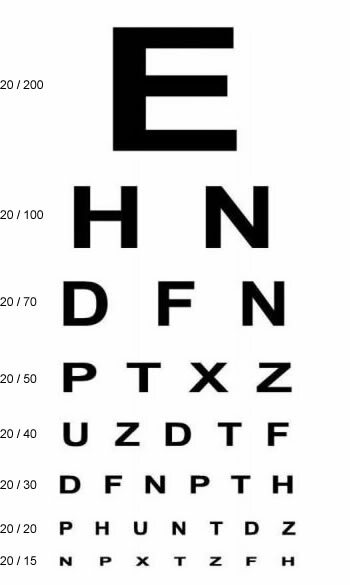 The first number in the description of visual acuity indicates the distance from the patient to the chart. The standard is 20 feet, so the first number is usually 20. The second number represents the smallest line on the chart the patient can read. For example, if the patient can only read down to the 50 line, then the vision is 20/50. In other words, the patient can see at 20 feet what a person with normal vision can see from 50 feet. Many people don't realize that 20/15 vision is even better than 20/20. With 20/15, the patient can see at 20 feet what a person with normal vision would have to move to within 15 feet of the chart to see. Laser vision correction can significantly improve a person's uncorrected vision. With today's technology, most patients are able to see 20/20 or better. Patients with low to moderate degrees of correction have predictably good results. However, some patients with extremely high prescriptions may still require the use of glasses or contacts for the best possible vision, even after successful surgery.